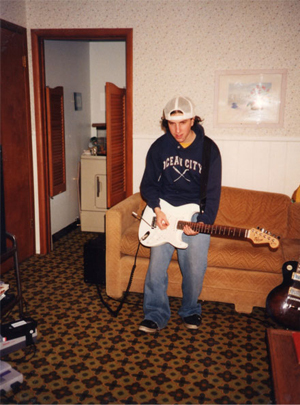 Blaow was the first incarnation of my one-man band. 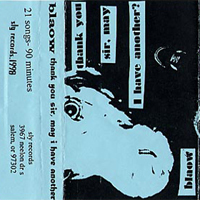 I wrote and recorded songs as Blaow from about 1994 to 1998. The name is taken from the Wu-Tang slang for the sound of a gunshot. It was the best thing I could come up with at 16. 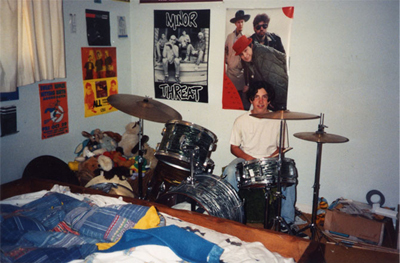 I was originally a drummer and never even picked up a guitar until I was in The CIA and the boys would leave their instruments at my house in between practices. CIA guitarist Corby Richards showed me the three chords to “Jesus Don’t Want Me For A Sunbeam” during my first and last guitar lesson and Blaow was born. I wasn’t all that good at guitar so I would write the majority of the songs on the bass, which I would play like a guitar. I recorded an album on the magic box of some lengthy instrumentals I had written, all about girls mind you, which consisted of just bass and drums. The one and only copy was stolen out of my car about a week later. Therefore, Sly Records 003, Blaow’s “What The Cut The Bull,” never came to be. For my next recording, “Thank You Sir, May I Have Another,” I recorded 21 songs, splitting the album between songs that I had written on the bass and the guitar and even found the nerve to sing. After that, for reasons I don’t remember, I then unfortunately decided that Blaow would simply become just me and an acoustic guitar, and even attempted to record another 90 minute opus, this one entitled “Little Halo.” It turned out terribly. It was at this time that I broke up with myself and hung up the Blaow name. Blaow never recorded again. Blaow never played a show. Thank God.